It’s a bit complicated, but in short the company is only selling one type of contact shape and size. This means that most subscribers are wearing the wrong type of contacts, which could cause bigger issues down the line if used for too long. Earlier this month Reddit user u/jessysav posted in the “You Should Know” subreddit about Hubble contacts. The user, who allegedly works for an optometrist, breaks down the issues with Hubble contacts and explains why everyone using the product needs to know about any potential risks involved. Hubble contacts are made with a material called Methafilcon A by Shine Optical Co. Essentially, the lenses only come in one shape and size and the material they’re made from is outdated. Very few contacts are still made with Methafilcon A and most optometrists won’t recommend products made from the material. It’s considered a bad material because it impacts how much oxygen is able to get into your cornea when in use. This is important, and if your eye can’t get enough oxygen it can lead to deeper issues such as swelling and permanent damage. According to the website from Dr. Claudia Lee, the optometrist that u/jessysav quotes in their Reddit post, “Hubble contacts are made with an old material called methafilcon A, which has a Dk/t of 18.8. Research shows that a Dk/t of 24 is necessary to maintain cornea integrity and avoid swelling.” The people that these contact lenses will really present problems for are those with astigmatism. Because the contacts only come in one shape and size it’s important to make sure that if you’re using the contacts, that they’re your shape and size. Dr. Lee emphasizes the fact that contact lenses are a medical device, and should be treated as such. 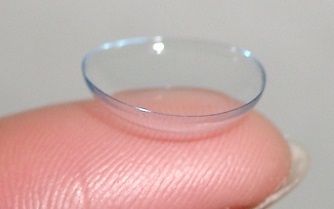 Contacts are not a one size fits all product, so it can do more harm than good if used incorrectly. As a user of Hubble contacts I can say that they’re not my favorite brand. They seem to dry out quickly and aren’t as comfortable as brands like Acuvue or companies that I get through my eye doctor—but they’re cheap and easy to get. That’s apparently an issue though, as the company was also recently caught giving out contact lenses to people with fake prescriptions from nonexistent optometrists. Yikes! If you’re looking for a good contact lens, make sure that you’re getting a product that won’t do more harm than good. Consult your optometrist about which contact shape and size, is right for you. If that shape and size just so happens to be Hubble, go for it!